SPARKLEEN has cleaned my carpet for meow than 20 years. They are thorough, responsible and great to deal with. Life throws curves every once in a while and it's good to have a top notch carpet cleaner on hand. Jeff and his crew at SPARKLEEN have the magic touch. Whether it is makeup that went flying out of my hand or cat and dog issues, he is the one to call. It's amazing what clean carpet does for your home or office. He is caring, honest and out before the whole day is gone. Her returns calls, makes appointments and shows up on time. Being considerate of my time is something I value and appreciate. SPARKLEEN is a company I'm happy to share with my family and friends. I have never heard a bad report for anyone that has used him. Pure pleasure. Just wanted to let you know that your service is superior and that you do an amazing job getting out of our carpets. I trust your Boys, and feel confident that they will do a good job. It's important to me, while having them in my home that I can trust them and know that they will do a great job cleaning. I would recommend SPARKLEEN carpet cleaning to anyone who need their carpet cleaned. SPARKEEN is amazing! ​I ​have white wall to wall carpeting and a scottie that bring in every speck of dirt that he picks up on his outings. For over 10 years Jeff and his family have kept my carpet looking fresh and clean. SPARKLEEN has always provided dependable, thorough and courteous service these many years. I recommend them to anyone who want their carpets cleaned. "Jeff and his team have been cleaning our carpets and upholstery for over 10 years. They are super friendly, always on time, knowledgeable about how different fabrics, carpet and fibers clean and dry, priced competitively and attentive to all details. Jeff always remembers what rooms we cleaned last and is honest what does and doesn't need cleaning. Jeff and SPARKLEEN are trustworthy people and reliable working in your home with kids and animals. We love SPARIKLEEN and know you will too!" Congratulations! You are about to have an exceptional experience! We have a two-story home in San Anselmo and have been using SPARKLEEN for carpet and upholstered furniture cleaning for over 20 years. The cleaning job they do is excellent; everything looks refreshed and new when they are done. As a working couple, we have appreciated their flexibility with scheduling day and times for cleaning. Their visit are efficient and professional and their rates reasonable. The best part, however, is the friendly service. My husband and I actually find ourselves looking forward to visits by Jeff and his crew. With our any reservations we recommend SPARKLEEN to you, and do so enthusiastically!" "We has SPARKLEEN Carpet Cleaners to our house one again lass week, and again a remarkable job was done. They have been cleaning our carpets for several years, and always do a fine job. The 2 young men are extremely sweet and courteous, and clean the carpet in a very timely fashion. I am constantly recommending thm to friends and neighbors". I have been using Sparkleen for 12 years now, and I clean all the carpets in my house each year. The owner Jeff, and now two more family members James and Mike are the nicest people you could hope to meet. The service is cheerful, top notch, and on time. I have had a few "carpet emergencies" (red wine on beige carpet, and a chewed ink pen under a glass table) and Sparkleen responded immediately - and got the stains out! I highly recommend their services. We have been a customer of Sparkleen for many years. The owner, Jeff, his son James, and Mike, their employee truly understand customer service. Not only is their cleaning service superior, but they value your business. This particular rug cleaning was complicated by a pet who had been ill--lots of accidents. They concentrated on one very tough area. We were resigned that we would have to replace one of the carpets. We were amazed to see the finished carpets. A beautiful job by a caring company. I met Jeff (owner of Sparkleen) through a referral almost 16 years ago. My whole family, and many friends use them. Jeff has now passed the business on to his son and god son. They are very good boys! They are responsible, professional and do a great job! They are just a pleasure to have in your home. I trust them all, and if I cannot be home for an appointment, I have no problem leaving them a key and letting them into my home. This is the type of service provider I want to work with! I have had several incidences where there has a been a "carpet emergency" and they always work hard to get to your house as soon as possible. I implicitly trust their services. "On behalf of Roots of Peace and the Kuhn Family, we are most honored to provide the highest level recommendation for SPARKLEEN Carpet and Upholstery Cleaning Service. 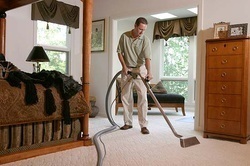 We have had the good fortune of closely working with their excellent cleaning service for the past three (3) decades. With each service, their team has arrived with cheerful, professional attitudes--always striving to empower their own employees with their high standard of work ethic. Over the years, many carpets have been cleaned, and window washed. Yet, the service from SPARKLEEN cleaner leaves our entire home with a pristine image that only comes from their founder--who give of themselves with pride in the home of others. Now, as the next generation of this family business prepares to 'step in' to our front door, we know that the ethics and principles have been deeply instilled. we may always be proud of the extra-plus work that goes in the cleaning of our family home--SPARKLEEN from within!" "I can't say enough about SPARKLEEN. I have been using them for years and am always very happy with the quality of their work. Their prices are reasonable and they are very pleasant to deal with. I've recommended them to many of my friends who are equally satisfied. James and Mike are conscientious and do a great job. Not only do they show up on time but in emergencies (like when wet paint was drooped on out good carpet) they have arrived in a jiffy and saved the day"